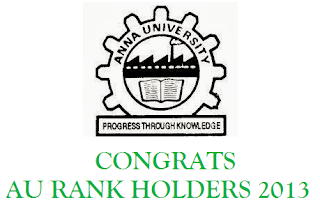 Anna university published List of rank holders list 2013 Passed Out Students. You can download the Rank holders list from the following link. 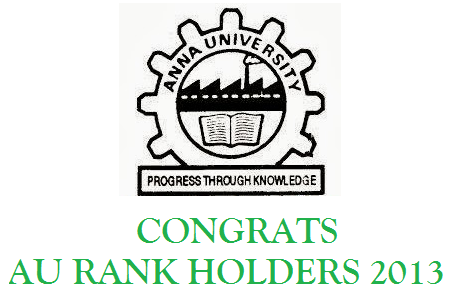 Anna university has a certain rules for giving ranks to the students as follows. A candidate shall be eligible for award of ranking only if he/she has passed the examination in first class or first class with distinction in the first available chance (i.e.) First attempt in all the subjects. Those who have availed the provision of break of study/withdrawal will not be eligible for ranks. Ranks are given at the rate of one for every 20 candidates passed or part thereof in each branch of study/specialization, subject to a maximum of 50. However, if the number of candidates passed in a particular branch is below 10, no rank is given.